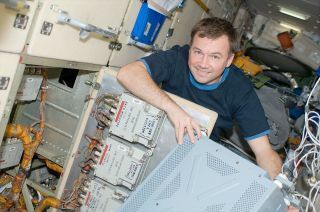 Cosmonaut Yuri Lonchakov, seen here on board the International Space Station in 2008, resigned from the Russian federal space agency, despite being assigned to a 2015 mission. A veteran Russian cosmonaut who was assigned to command the International Space Station in 2015 has unexpectedly resigned. Cosmonaut Yuri Lonchakov tendered his resignation to the Russian federal space agency, Roscosmos, on Thursday (Sept. 5). Russian news agencies, quoting the head of the Gagarin Cosmonaut Training Center, reported Lonchakov will be "formally discharged" on Sept. 14. Lonchakov was scheduled to fly as the commander of the Russian spacecraft Soyuz TMA-16M, launching in March 2015 with Roscosmos cosmonaut Mikhail Kornienko and NASA astronaut Scott Kelly, the space station's first two yearlong crew members. Once on board the orbiting laboratory, Lonchakov was set to join the Expedition 43 crew as a flight engineer before taking over command of the space station as the leader of Expedition 44 in May 2015. He was then to return to Earth in October 2015. Lonchakov's replacement on the crew was not announced. Backing him up on the Soyuz TMA-16M crew was Alexei Ovchinin, a fellow Roscosmos cosmonaut. Lonchakov, 48, joined the cosmonaut corps in 1997 and flew three spaceflights to the International Space Station. He first launched on NASA's space shuttle Endeavour as a member of the STS-100 crew in 2001, helping to deliver the Canadarm2 robotic arm during the 12-day mission. The next year, he flew on board the first Soyuz TMA-class spacecraft, Soyuz TMA-1, for a 10-day flight to the space station. Lonchakov's third — and now final — spaceflight began in October 2008 with the launch of Soyuz TMA-13, the 100th crewed Soyuz spacecraft to fly. Serving as an Expedition 18 flight engineer, Lonchakov spent 178 days in space, bringing his career total to 200 days (and 19 hours) off the planet. During his last stay on board the International Space Station, Lonchakov also performed two spacewalks to retrieve and install science experiments mounted on the outside of the complex, for a total extravehicular activity (EVA) time of 10 hours and 27 minutes. Krikalev said the reasons for Lonchakov's departure were not clear. The new job that lured Lonchakov away from the cosmonaut corps was not disclosed. Lonchakov is not the first career space explorer to resign for a new career, even after being assigned to a mission. NASA astronaut Joan Higginbotham left the U.S. space agency in November 2007 to become a vice president of an oil company. Her departure came the month after she was named to the crew of STS-126, which would have been her second space shuttle mission.